Are you looking for adding a loading bar for your blogger site? Then Pace.js is a very good option comes with different types of loading styles. Pace.js is a automatic page load progress bar. Including pace.js and a CSS theme of your choice, and you get a beautiful progress indicator for your page load and ajax navigation. To add Pace.js loading progress effect to your blogger blog, follow the steps given below. 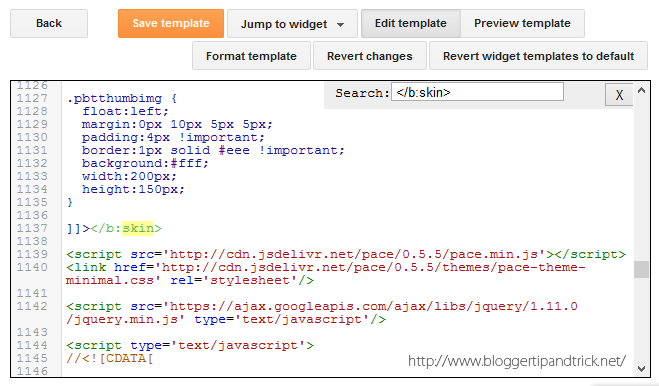 First go to "Edit HTML" of your blog. Save your blogger theme and refresh your site. Now you can see the loading progress effect.